Gubernatorial candidates (from left) Jay Gonzalez, Bob Massie, and Setti Warren before Monday’s forum on the environment. The three Democrats vying for the state’s top office blamed Governor Charlie Baker Monday for failing to take more aggressive action to combat climate change, promote public transportation, and protect the environment. 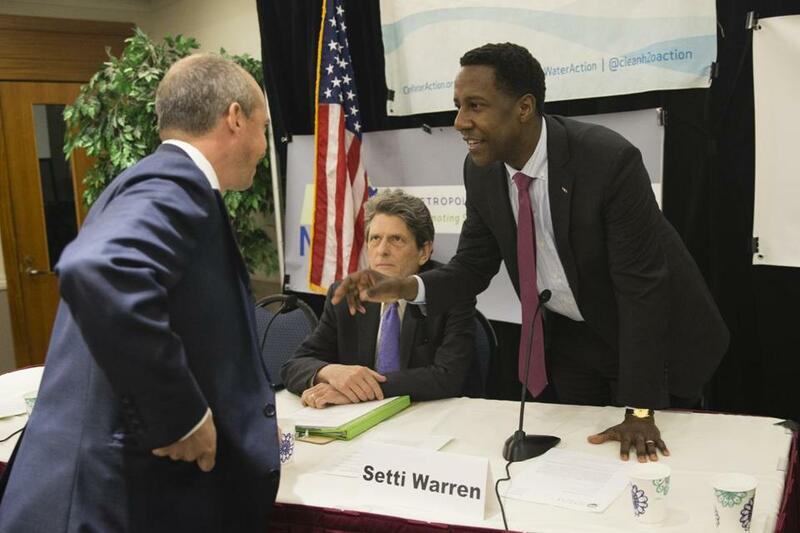 At a Suffolk University forum organized by environmental groups, gubernatorial candidates Jay Gonzalez, former governor Deval Patrick’s budget administration chief; Robert K. Massie, an environmental activist and entrepreneur; and Setti Warren, the former Newton mayor — largely offered similar views on a range of energy and environmental issues. But each criticized Baker for his environmental record, saying he had not made the issue a priority or done enough to resist the Trump administration’s rollback of environmental regulations. “I think we need to be aiming a lot higher,” said Gonzalez, who took issue with the notion that Baker is too popular to beat. Warren joined the other candidates in pledging to devote at least 1 percent of the state’s budget to environmental issues. Warren noted that he was the only candidate with experience as a chief executive. The forum was sponsored by the Environmental League of Massachusetts and nine other environmental groups. Baker was invited to attend but said he was unavailable, forum organizers said. Baker has raised nearly $8 million for his campaign, while the three Democrats collectively have less than $200,000 in cash on hand. But Massie told the crowd not to worry, noting that Democrats have won in special elections from New Jersey to Virginia over the past year. “If a Democrat can win in Alabama, a Democrat can win in Massachusetts,” said Massie, who has founded environmental groups including the Global Reporting Initiative and the Investor Network on Climate Risk. Democrats will hold their political convention in June, when each of the candidates has to secure at least 15 percent support from party delegates to appear on the ballot for the September primary. The general election is in November. Billy Pitman, a spokesman for Baker, defended the governor’s record. The Democratic candidates, meanwhile, addressed a range of topics, from what they would do to promote renewable energy to how they would comply with a state law mandating reductions in greenhouse gases. In response to a question about how to maintain a reliable power supply without promoting fossil fuels, Warren, an Iraq War veteran who worked in the Clinton White House, said he would push the state to build more offshore wind power and solar energy. Gonzalez said he supports similar proposals, saying he would finance them by raising taxes on millionaires and imposing a tax on companies that produce carbon dioxide. He also took aim at Baker for not doing more to address climate change. Massie suggested that the state should seriously consider building a barrier in Boston Harbor to protect the city from rising sea levels. Government studies suggest sea levels could climb as much as 10 feet by the end of the century. “We’re going to have to consider retreating” from some areas, such as parts of East Boston and the waterfront in South Boston, which will become increasingly prone to flooding in the coming decades, he said. For some of those attending, it was their first opportunity to learn about the candidates. Allan Fierce, 71, a retired state employee from Stow, said he plans to support Gonzalez. “I was leaning toward Bob,” he said, but he felt Massie had more of a “gauzy view” of the issues. Georgia Bell, 20, a political science student at University of Massachusetts Boston, however, said she planned to vote for Massie.